Thursday, April 19, 2018 - 7.30 p.m. 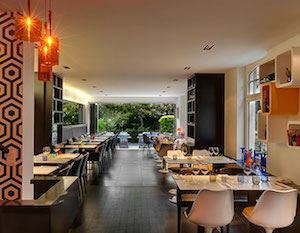 In April, we are taking you to Gou, an excellent restaurant in walking distance from Place Dumon and the Stockel metro station. The space is smartly decorated with modern furniture and features a lovely garden terrace in the back. The black and white decor is magnified by pops of color everywhere in the form of beautiful objects and quirky ornaments. The cuisine is delicious and made with quality seasonal products fresh from the morning markets. The service is friendly and professional. If we are a big enough group, we will have the Conservatory at the front of the restaurant all to ourselves. Whether you are new in town or a long-time resident, dine-outs are a great opportunity to discover new restaurants in Brussels, meet old friends, make new ones, have fun and eat well at the same time. All of this for a reasonable and all-included price. If you have not yet been to a Dine-Out, this event is for you. Half a bottle of wine and sparkling or still water per person. Please indicate your menu choices when registering. Easily accessible by public transport: metro Stockel or tram 39. Price: €45 for ACB/AWCB/CCB members. Non-members: €50. Price includes a three-course menu, apéritif, half bottle of red or white wine per person, water, coffee or tea. Payment in advance to ACB account BE55427919588144 (KREDBEBB). Please mention “April Dine-out” in the reference section of the bank transfer. Online payment with a credit card is also possible (through PayPal, but no actual PayPal account is required); pay when registering or use the link provided in the invoice. Cancellations are possible until noon on Tuesday, April 17. Participants cancelling after this time, as well as no-shows, are charged the full cost of the event.